April 6, 2007: How are we doing? About two weeks after I wrote the Jan 12, 2007 page describing my favorite investment strategy, I figured it is time to become more accountable and start to actually manage a portfolio following the strategy. After all, this is the only honest way where I can be certain how well (or badly) the strategy is faring in the real world. I never felt really comfortable with historical back-testing of investing strategies. The past is known with 100% accuracy. There's always the trap of overfitting the data, or having some subtle bias towards what we already know. So I opened an account on Marketocracy, went over my machine generated list of most attractive ETFs - with some skips to avoid too much concentration in similar asset classes - and put in some limit buy orders for top ranked ETFs. 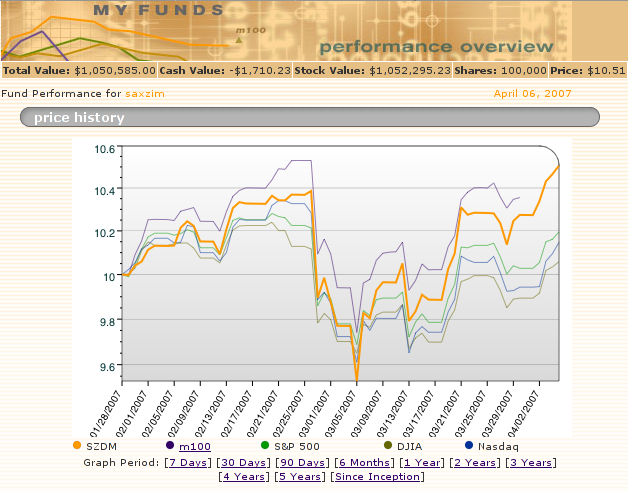 I called my virtual mutual fund "Sax-Zim DataMine" (Ticker SZDM). Why Sax-Zim? It's a long story, I'll skip it for now. Buys/Sells at the ask/bid (respectively) price only when the actual trading volume of a security exceeds your order by a big enough margin to emulate real-life conditions. Charges virtual 'management fees' of about 2.0% annualy deducted daily from your balance to simulate a real world money management handicap. Keeps track of your performance vs. the 3 major US indices (Dow-Jones 30, S&P500 & NASDAQ) on a daily, weekly, monthly, quarterly, yearly and since-inception basis. Paying dividends, accounting for splits, acquisitions, delistings, etc. Just like a real portfolio would. You can do better in a tax-free account: IRA or 401(k) plan, and/or where you're not saddled with a whopping 2% management-fee drag and relatively high transaction fees imposed by the Marketocracy game rules. But I was ready for the challenge. The handicaps would only make my strategy more convincing if it works. Marketocracy claims 80,000 members, each with some strategy they believe is market beating. Indeed, a few of the top investors on Marketocracy seem to be doing very well. You can learn a lot just by watching the best (and ignoring those that have pure luck, e.g. concentrated and leveraged portfolios). This looked like it would be not just a challenge but also a great learning experience for me. As it turned out, I was as unlucky as could be in my first [mis]steps on Marketocracy. At first, I put orders to buy ETFs with too low buy-limits as the markets rocketed up. Because of the limits I managed to enter only about a 60% of my initially planned positions. About a week later, having missed some of the run up, I realized I'm not yet compliant with Marketocracy's ground-rules (they don't "pay you" virtual management fees to sit on cash), so I got pressured into buying the remaining 40% of the portfolio at relatively high market prices. The end result was that I entered my positions (especially the latter 40%) very close to an intermediate top in the markets. In addition to all the problems, Marketocracy bought one of my ETFs in two batches adding some more drag with high trade commissions. On Feb 27, the markets started a mini-crash which wiped my initial 3.8% gains in short order. About two weeks later, at the trough of the crash, the portfolio showed an overall loss of about 4.8% since inception. Nothing catastrophic, but a pretty disheartening start for what I hoped would be a successful lifetime endeavor. Lest you get disheartened, they say "it is always darkest before dawn." The strategy dictated that I stay the course, so I didn't budge. I was 100% invested in pretty good assets, and determined to keep following a strategy I deeply believed in. And I'm happy I did. On March 5, just one day before I wrote the page about violent corrections and their aftermaths, the markets hit bottom and a very strong rebound ensued. SZDM was back in break even territory within 7 trading days. During the ten weeks since I started the Marketocracy adventure, the SZDM portfolio has beaten all 3 major indexes soundly and consistently. It has trailed the NASDAQ only in 2 weeks out of 10, and each the DJI and S&P500 1 week out of 10. Think of it as a batting average of 26 out of 30. Overall, SZDM has had a pretty impressive, and consistent, almost too good to be true, 10 week record. Despite the rocky start: the misguided decisions, the 2%/year drag, the entering into most positions near a top, and the high trade comissions, SZDM is already up by 5.06% in just 10 weeks. Not just any 10 weeks, but a 10 week period which included a pretty violent market correction in its midst. Here's a chart (SZDM is in orange) detailing our rocky start vs. the major indexes and the mean of the 100 best Marketocracy portfolios (m100). Note: this is just a snapshot of the real page, so the links in the image wouldn't work. It gets better. Extrapolating the performance of SZDM, shows an alpha of 19.43% annualized in excess of the S&P500 (the S&P long term record is 10.93%/year). That's about 30%/year including intermittent corrections, if I can keep it up, of course. And a bit better: In the past month SZDM has been steadily climbing in the overall Marketocracy rankings, starting at about 40% rank (better than 40% of the members, and worse than 60%) during the rocky start. It moved up to almost the median (47.5%) 4 weeks later, while climbing the ranks at a very fast rate. As you can see from the chart above, the next ranking update should place SZDM above 75% of the site members if not better. Am I perfectly happy? No. I'm not very happy about the SZDM beta component which is 1.35 (about a 1/3rd more volatile than the S&P500 on a daily basis.) I plan to reduce it with time by picking less correlated ETFs from the top ranked list. However since I manage SZDM under normal tax assumptions, I prefer to move slowly (hold whatever I can for a year or more) and generally keep a low turnover. I also believe my beta will decline with time as the sample grows and I get better in executing changes. Please don't get me wrong: assuming 35% more risk than a broad index like the S&P500 in return for over a 200% annual excess return over it, is by no means a bad record. The risk adjusted return here is in fact very good. Still, reducing risk should always be a goal of every portfolio manager. Another thing I'm not so happy about is that I cheated a little bit. 3 out of 17 ETF components in SZDM (VNQ, RTU, and IXG) were picked outside the strategy - mostly in the name of adding diversification. The pure strategy performance is even better than what SZDM shows even on top of discounting the management fees. The strategy is so strong that it allows for some mistakes. 3 out of 17 is 17.6%. 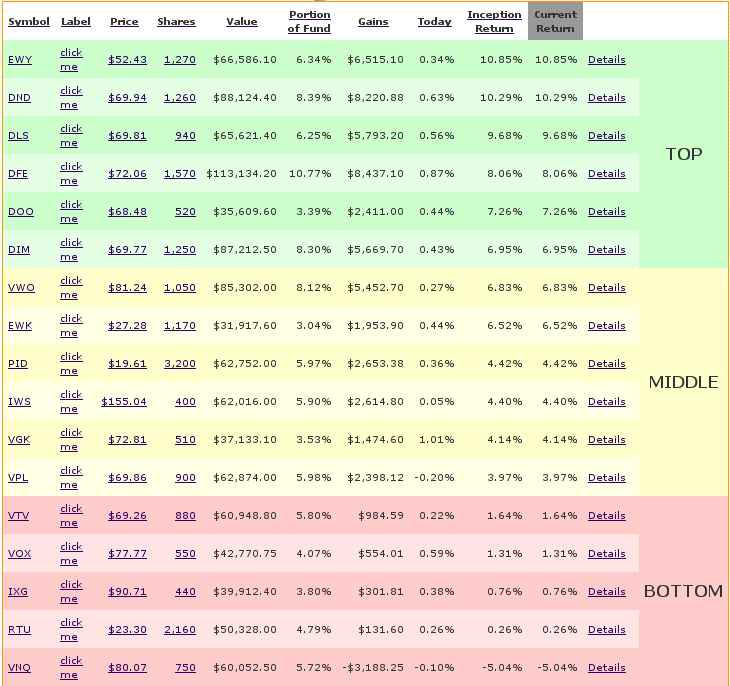 IOW: I botched almost a 1/5th of the portfolio by trying to outsmart the strategy. Still, the winners more than compensated for the few relative losers (only VNQ was an absolute loser, the other two show tiny gains). The losers which I have only myself to blame for not following the strategy. Mistakes are wonderful things - if you learn from them. For the full record, here's a screen snapshot of the components of SZDM as of today, 2007-04-06 (Good Friday, markets closed, so the 'today' column actually refers to yesterday) - again screen capture, so links wouldn't work. And here is the full SZDM ledger since Jan 28, 2007 [xls spreadsheet] with all dates, buys, dividends, fees, a total full disclosure, I hope. I plan to keep providing the short "performance-highlights" updates with future musings. Thanks for reading this far. I hope you find this useful. Good luck with your investments.